The Ocean Training USA courses include full USA Animations.In fact there are over 370 of these. They include the complete US Coastguard Syllabus. 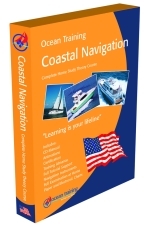 All our courses for the USA include an Ocean Training Manual which is at the heart of your learning. Working through a series of modules you'll find you've completed a learning exercise. Your tutor is available to mark and guide you through every stage. At the end of your learning you are ready for the exams which you complete at home or wherever you are on the globe. All we ask is that someone invigilates for you. The exams will be enjoyable as all our courses will adequately prepare you, as long as you follow and complete all the work. We give you full RYA/MCA certification upon completion. Our US courses are highly regarded. We are the recognised trainers for the Lifeboat Services in amny countries including the RNLI), The Royal Marines, MCA and Worldwide Port Operations Authorities. Need we say more? US Navigation and Safety - How Much Do You Know?